I think it starts either today or tomorrow, I was just placing an order when I saw the ad although I'm having a little trouble finding a list of titles for this sale. Still doesn't work online. Was really hoping they goofed again and the Elite discount would apply to the original prices again. It doesn't work online. In Store Only. Since I have a copy of a rare ps3 game coming in from another location this is perfect for me right now. This has been going for a while. I just bought my second batch of PS3 and Xbox 360 titles last Saturday. Good for those last-gen collectors/hoarders/whatever you want to call us that sounds nice and isn't too judgy. Not too many PS4/Xbox One games that aren't Destiny/sports games. Can you tell that I like using backslashes in my posts? this. Damn these instore deals. Since i mostly care about 'retro' this doesnt do much for me. Their little display with 4.99 selection games is usually pitiful. It's supposed to work online, it's only on preowned games but the above link was for all games under $4.99. I can't post an image because I have less than 3 posts (wow I'm a veteran lurker, I've been using this site for years) but if you click the ad on the website that says 4 for $10 and scroll down, it says "4 for $10 on Select Pre-Owned Games $4.99 or Under. Shop online or in-store today. Offer valid through 5/13/18." So set your filters to only include pre-owned titles or follow the link on that page. Edit: And by the way seems like they artificially jacked the price up on some things to exclude them from the sale, the above link has ESO on PS4 for $4.99 but in the link to the sale it's listed as $6.99 used so you can't get it. I'm seeing in the top right corner in-store only of the logo on the main page. I'm sorry, I need to do a quick double post so I can post this image, please forgive me CAGers. It could be an accident but this is what it says on their ad page. Edit: Maybe they just meant you can look at what's in the store online... in which case that's some confusing and terrible wording but technically valid I guess. I'm guessing the DS games will 100% be no case and everything else will probably broken or no case right? I'm sure you're right and it's supposed to work online, but when does Gamestop's website ever work properly. OK, exaggeration, but they do have a lot of site issues. More backlog stuff, just what I need! 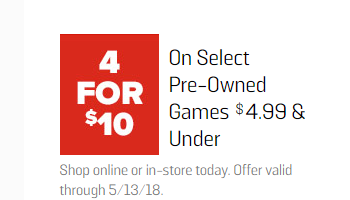 On the main page of GameStop.com, they have a banner about the 4 for $10 and it says "In store only". Even when it's supposed to be new, be careful. Last year I tried buying Shantae, New mind you, the price was like $15 and the dude just pulls out the disc in a sleeve. I ask him what happened to the box, the booklet, and the soundtrack (it was a limited edition set) and he just tells me "yeah, people steal them....so you still wanna buy it?" During checkout, do the employees ask for ph# on elite pro too? If they scan your card there shouldn't be a reason to ask for your number. That should work. Unless someones willing to have their ph# out in public. Would be easier if the 4/$10 would work online. What about a picture of my card? Just download the app and sign in with your info and go to card details and they scan the barcode. I think this is ymmv because my three locations only ask for my card. I picked up Wii and Wii U games for my niece and nephew. Biggest score was Animal Crossing Amiibo festival with both Amiibos inside. I think employees have gotten used to asking for a phone number (under the assumption that the customer doesn't ever have their membership card). They're essentially just trying to skip the first step and save themselves time and annoyance I'd imagine. It's standard, robotic procedure at many stores I've been to, albeit against policy. Unless there's some bizarre new policy where they get your card and still ask for your number, which seems unlikely.